Tuberous roots can be stored under modified or controlled (low oxygen) atmospheres for months at higher temperatures than is stored in air. Believed to be sensitive to low temperatures just above 32F (chill sensitive). Store closer to 40F. Gets its name from the hood-like enlarged sepal that occurs on each flower. One of the best blue colored flowers. 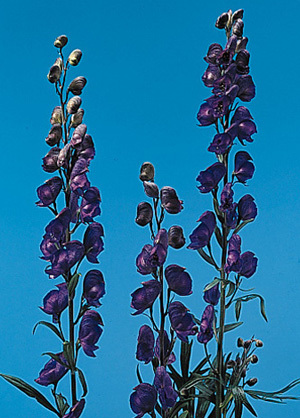 Another common name for this species is wolfsbane because its poisonous roots were used as bait to kill wolves. The poison contained in all plant parts is aconite, which has been used as a heart sedative. Commonly grown in gardens and landscapes. Flowers can also be dried. Harvest when first flowers start to open.